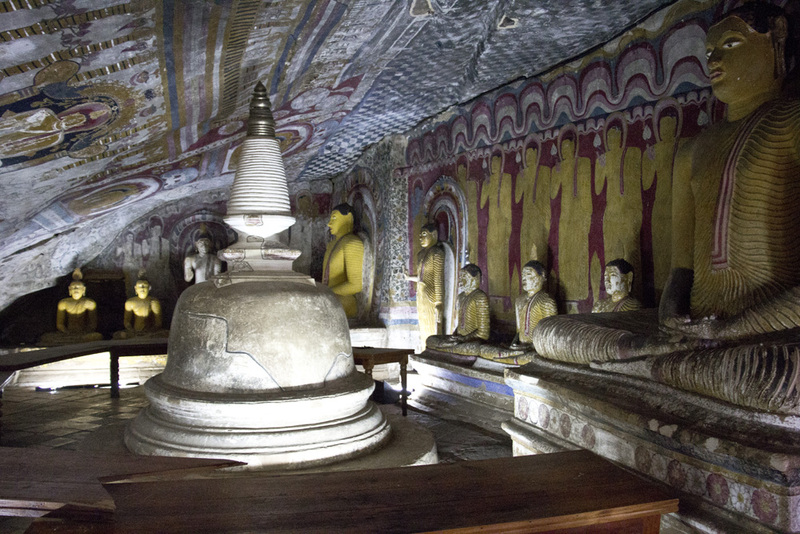 Tucked away on the side of a mountain in central Sri Lanka, there are five caves filled to the brim with Buddhist shrines. These caves have been here since prehistoric times, but since the third century BC, they have served a more holy purpose. 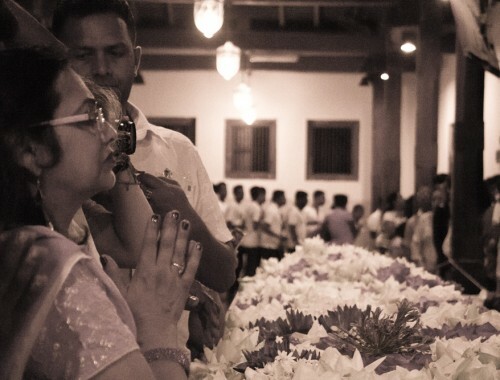 Together, they make up Sri Lanka’s famous Golden Temple located in the small town of Dambulla. 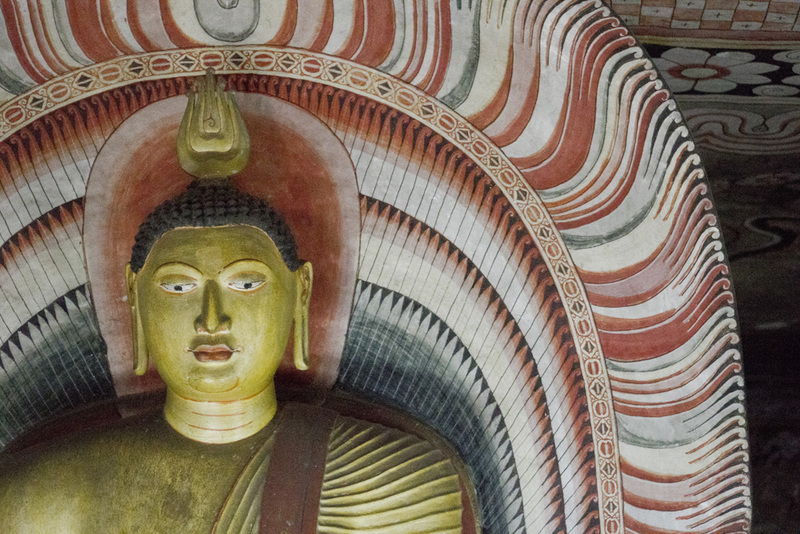 Stone statues of the Buddha line the cave walls, which are painted with geometric and spiritual designs – painstakingly detailed designs. 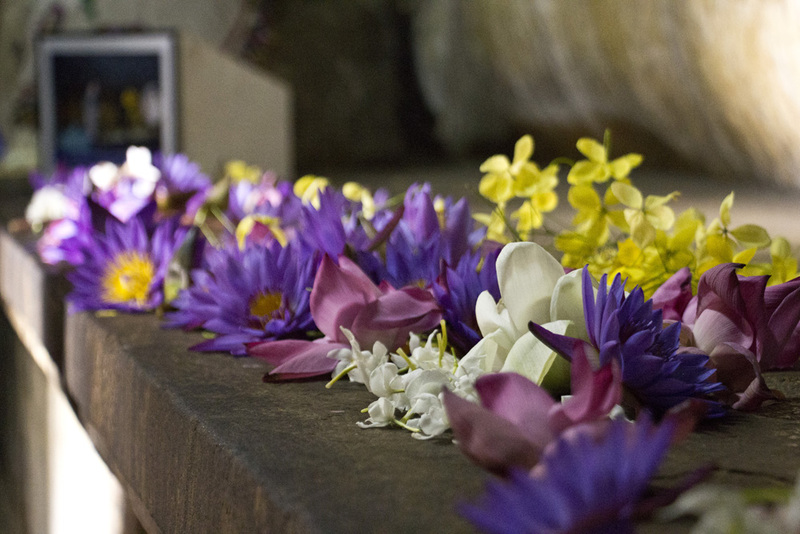 Devoted Buddhists dressed in linen and technicolor sarees silently float in and out of each cave, leaving behind flowers and prayers. 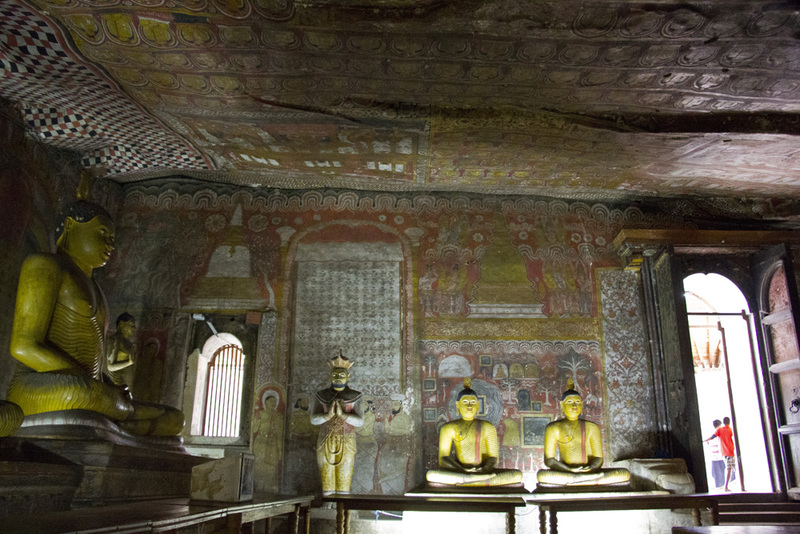 While I’d just crowned Sigiriya as the most unique temple I’d ever seen, these caves were definitely giving it a run for its money. 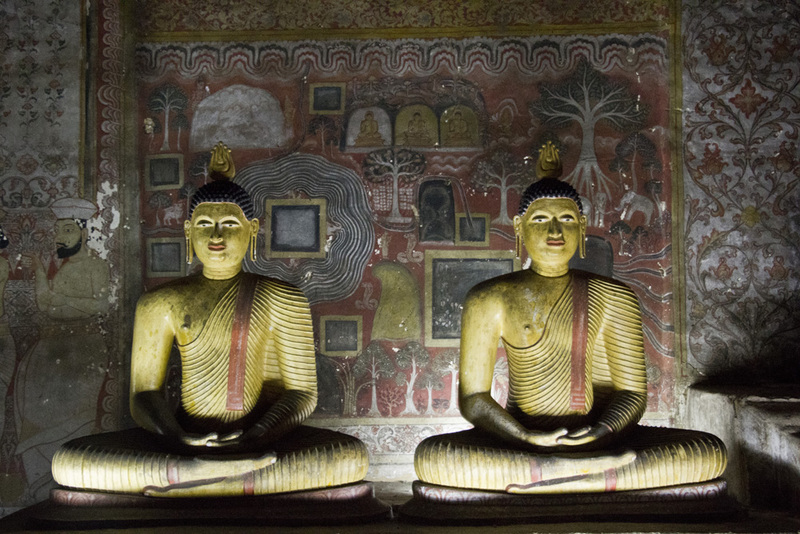 Dambulla is a short 20-minute drive south of Sigiriya. 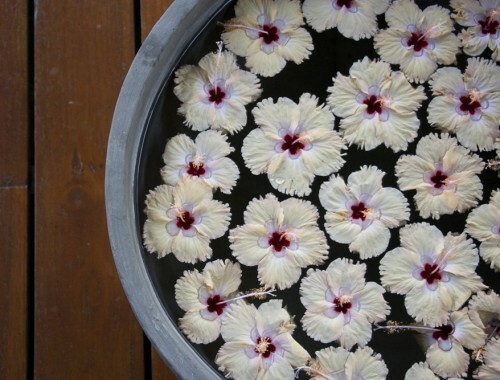 It’s small and dusty with little to see except an enormous wholesale market and the Golden Temple – you don’t need to plan a lot of time in town. 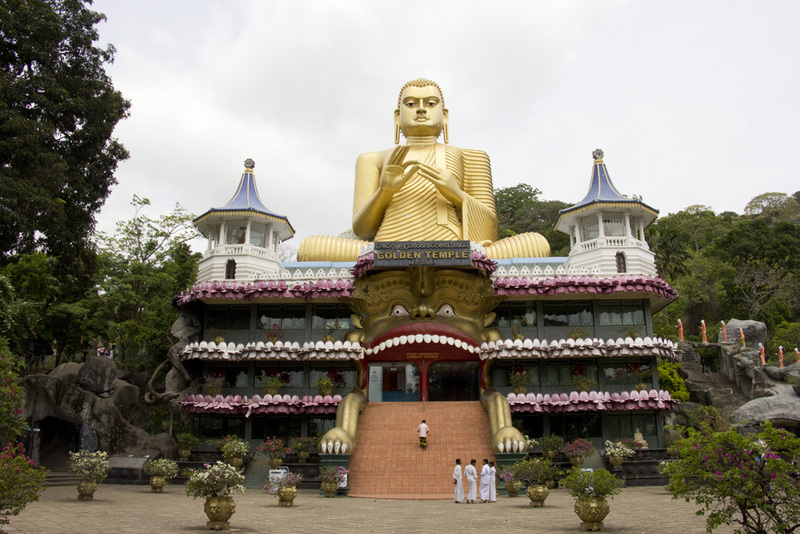 We made our way here on a day-long road trip that took us from Sigiriya down to Kandy with stops in Dambulla as well as Matale to visit the Hindu temple Sri Muthumariamman. When we arrived, I have to say I was a little surprised. I’d shown up expecting to visit a spiritual UNESCO world heritage site and instead pulled up to a building that didn’t match the theme of thousand-year-old Buddha statues in the slightest. 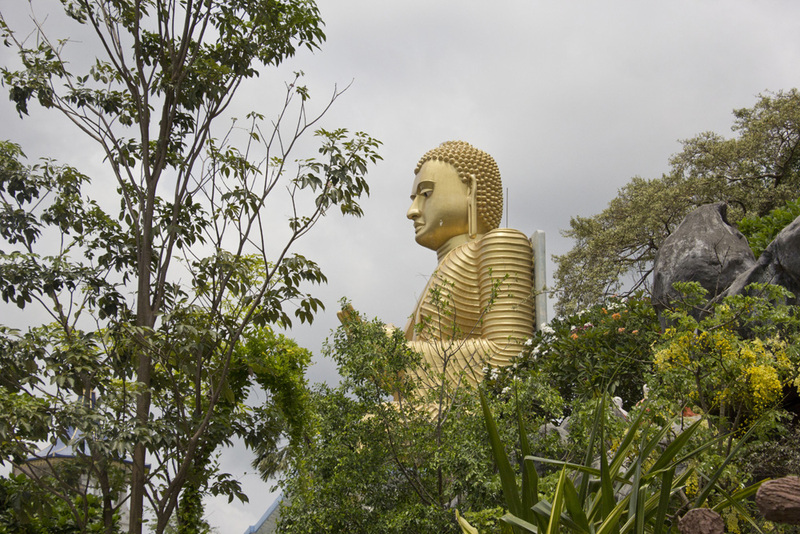 In an effort to preserve the cave temples and create a better visitor experience, a Buddhist Museum and golden Buddha were built in the 1990s at the base of the hill. Good in theory. But strange in person. It’s quite possibly the weirdest museum ever and I didn’t even go inside. I understand that its presence alone is part of a process to protect and restore this site for future generations, but I’m not sure why some of the uh, design choices, were made. 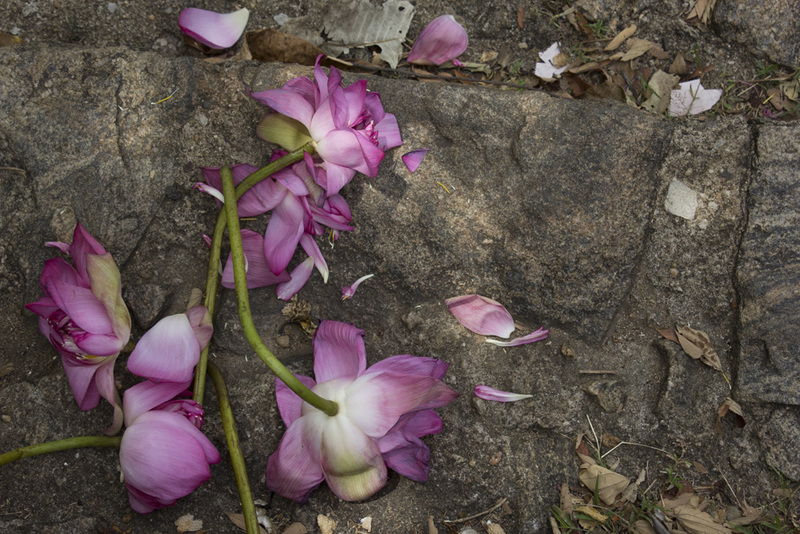 Those pink and white plastic things attached to the outside of the building – are they petals? or teeth? or tongues? I don’t know what to make of it. 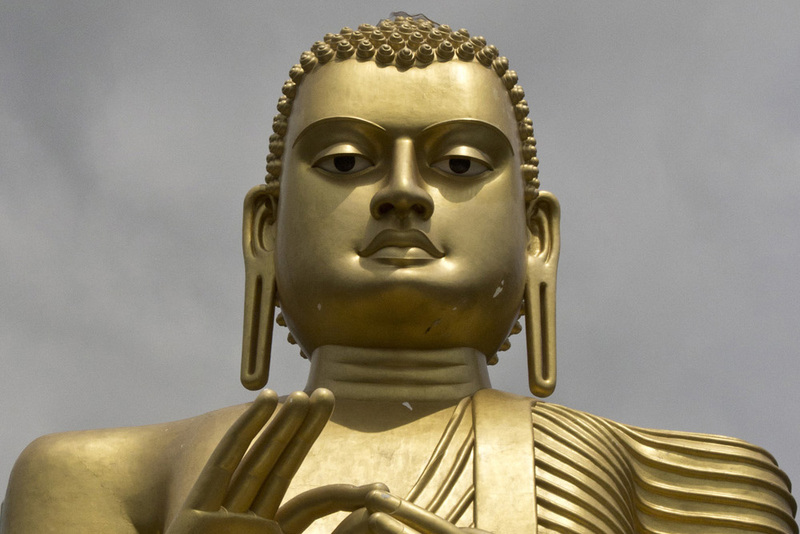 But what I did like was how intimidating and impressive the massive golden Buddha was. I couldn’t take my eyes off of it. 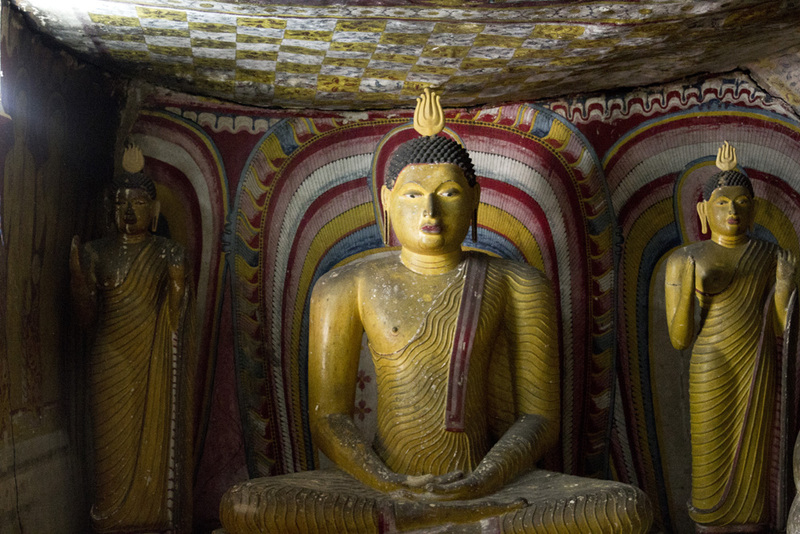 Up on the mountain behind the strangeness that is the Golden Temple museum, you’ll find the five caves. 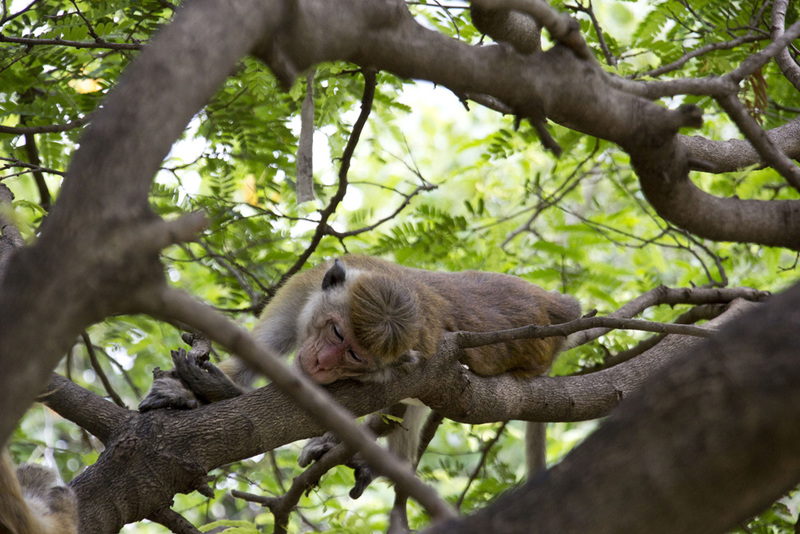 The hike to the top is strenuous, especially in the intense humidity (even the monkeys weren’t their normal thieving selves that day). But of course the view across the valley is stunning, and you feel like you’ve truly earned the experience by the time you get up there. 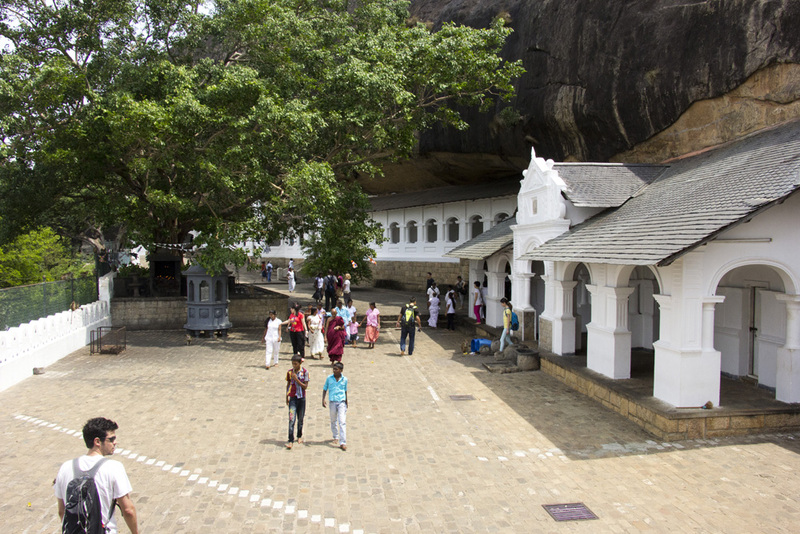 After leaving your shoes with the shoe master and paying the USD$15 entrance fee, you can visit the caves which are just behind the white awnings. The official guides recommend that visitors start at the closest cave and working your way towards the back, but we deferred to the Lonely Planet’s advice on this one. Mr. LP suggested to start the back and work your way forward as the most spectacular caves are near the front. Starting with the most beautiful will only make the smaller and more humble caves look less impressive. I would also recommend this. 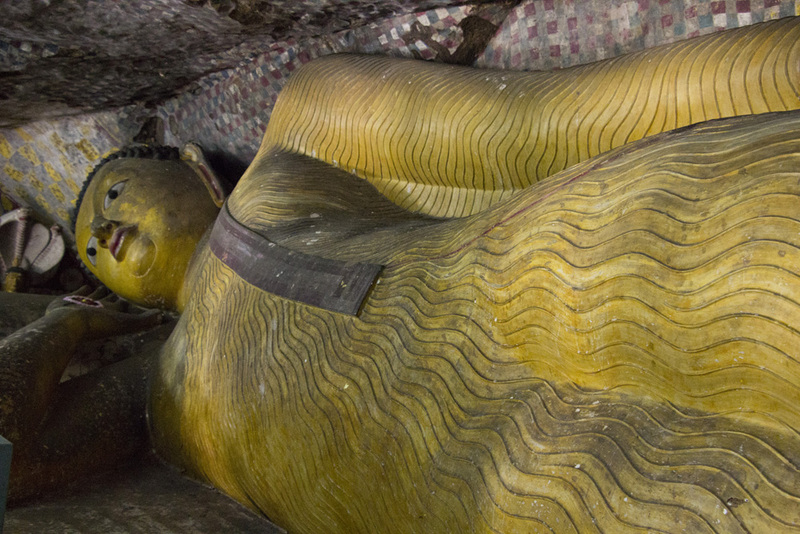 A reclining Buddha carved right out of the cave wall. Super cool. It doesn’t take much more than an hour or two to explore the caves, but they are definitely worth the time if you are in the area. 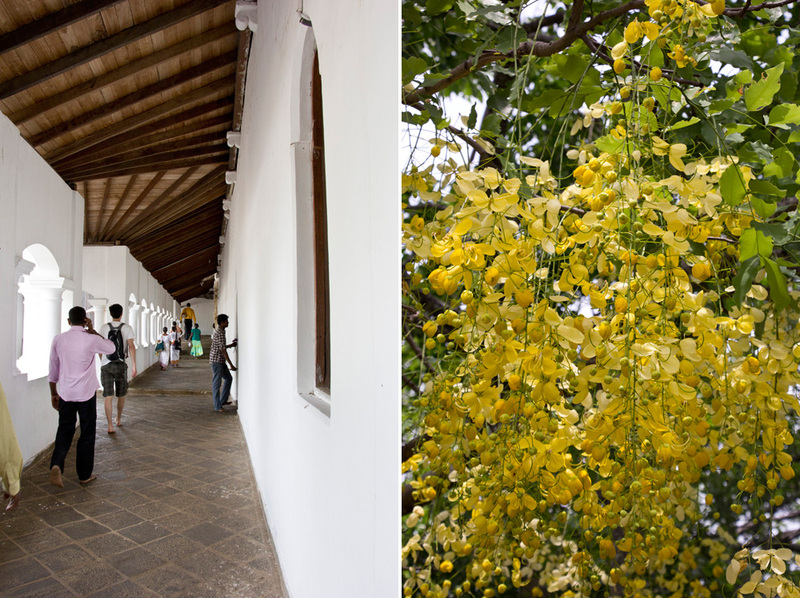 Many tourists stick to the southern part of the island and never get a chance to see this kind of history. I think they are missing out. Well, maybe not on the museum – but definitely on the caves. That place llos amazing! I want to go. 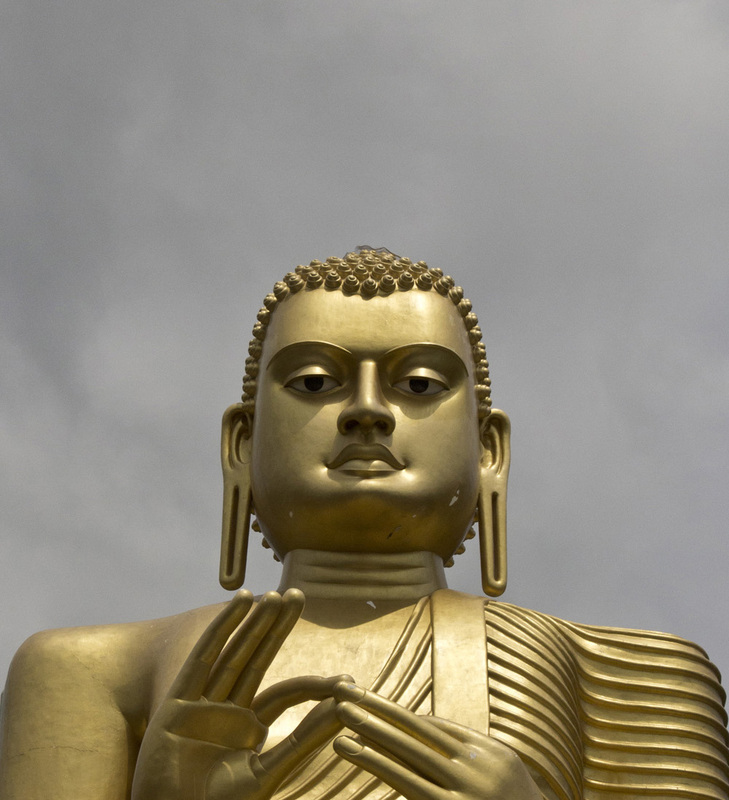 I like the Buddha Through the Trees picture. It looks as if Buddha is playing with his smartphone.